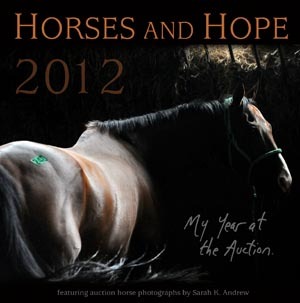 The impossibly beautiful Hope & Horses calendar, featuring rescues from the Camelot auction. Order by clicking on this image. Really, all of us have all the stuff we need, and pretty much everything we want stuffed into our tack trunks and hanging from our pegs in the tack aisle. Our horses are fat, sleek, shiny and loved. Still, I demurred. Fundraising, despite the first three letters of that word, isn’t terribly fun. But then I saw the video. And got on board real quick. Instead of gifts, I asked my guests to contribute what they would have spent on a doo-dad to a donation to HARPS. They responded and together we have raised $500 to off-set some of the expenses HARPS has incurred in the rescue and subsequent care of young Tiger. $500!!! Yay! I’m going to to visit him this week and drop off the donation, and look forward to updating you on how he’s doing. So, reallocating some funds and not buying something you don’t need is one way to free up budget for a little charitable giving. Buying some of the cool things the charities are offering is another. Here’s my favorite story of the season this year. The Facebook Group Camelot Horse Weekly has more than 26,000 members, who weekly work together to spread word about the horses sold for meat at the Camelot auction. The auction operator is one of the very few who works with the rescue community, and the relationship is mutual and symbiotic. And almost every week, that pen is cleared, and new homes are found for the horses who, unaided, would be trucked off to a slaughterhouse. And slaughtered. One key reason why the Camelot group has been so successful is a woman named Sarah Andrews. She’s an equine photographer, and the author of the Rock & Racehorses blog. She’s also a proud OTTB owner, and she’s been on my blogroll since this blog started, and in my RSS reader prior to that. She’s awesome. The pictures she takes of the horses in the pen at Camelot are heartrending and beautiful. She gathered her favorites together and published a calendar, with proceeds benefitting One Horse At A Time, a rescue that takes in a lot of Camelot horses, including some of the most unwanted of the unwanted – the aged, the infirm, the really lame. Sarah recently presented OHAAT with the first check from the sales of the calendar. The proceeds? $26,000 !!!! Twenty six large! And there’s more to come, especially if you order a copy or two for yourself and some friends today. Important: Congress just passed a law lifting the ban on the slaughter of horses in the US, plants are coming on line here in the States. We can expect that horses will start to be slaughtered here in the US in about a month or two. Awesome. Way to go Congress. The American public doesn’t support slaughter but foreign business interests do, and their lobbyists line your pockets. Nice work, jerks.